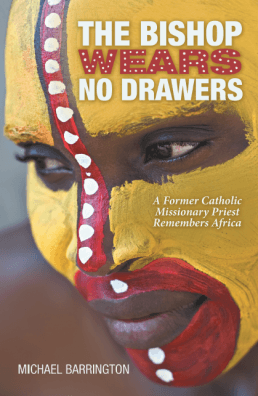 Michael Barrington has written a riveting memoir about his experiences as a young missionary in war torn Nigeria. Malaria, heart wrenching losses and a personal religious struggle are among the traumas in the pages of this must read book. Michael also provides readers a rare glimpse behind the doors of the Catholic Church during a pivotal time in its history. Prepare to be spellbound and bring your checkbook. President Doug recognized Kathleen Archer for her work with the Global Community Service Committee for her work in obtaining matching funds. As a result of Kathleen’s hard work, a global grant has been approved for microloans in Colombia to provide startup funds for local cottage industries. Will Haymaker – Feb. 24th is Bring a Guest day. Emily Harrington– Sponsorship packets have been sent to everyone in club. Let her know if you have ideas for others to send the packets to. We are on the way to increasing Giro Bello sponsorships! 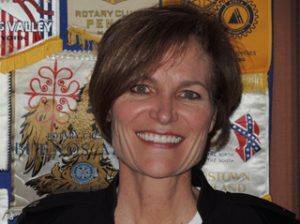 Jackie McMillan – reminded us that we are at St. Rose next week. Rich de Lambert let us know that Dan Shell is almost finished with radiation and hopes to be back with us in a couple weeks. David Brown, purveyor of the Super Bowl squares still has some $20 squares to fill. Robby Fouts resumed the raffle with marbles this time. There was $35 in the pot today, but no winner. Two new members were inducted today: Carolyn Fassi and Bill Crowley. Welcome, red badgers! 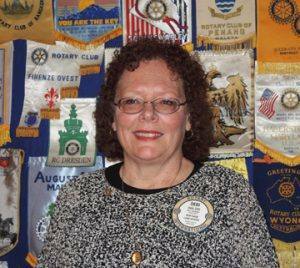 PP Debi Zaft was chosen as the January Rotarian of the Month for all she does for our club. Jumping in where there was a need, Debi covered the secretarial duties for Jack Abercrombie as he battled pneumonia. There is a particular sound a gun makes when it’s being shot at you. Which Rotary Peace Fellow heard the bang of the gun being fired? Where was he and what was he doing? Page 47. The Giro Bello website has been launched (girobello.com). We are ramping up for a fantastic day for 1,000 riders on Saturday, June 25th. That means we will need all Rotarian hands on deck to help with rider registration, pre-ride party at Franchetti’s, food preparation for the ride day, rider safety, communications, post-ride celebration at O’Reilly’s, and many other issues. As Emily Harrington mentioned at this week’s club meeting, we also need sponsors. Please contact your friends and contacts in our community who could be a sponsor for the Giro Bello. The funds we raise from this wonderful ride will be used to fund all of the great projects our club is known for. Dictionaries, Scholarships, NewGen Peace Builders, Living Room assistance, clean water support and the list goes on. All you have to do is ASK. A sincere thank you goes out to the following Rotarians who have volunteered to mentor the students through the completion of the Action Peace Project. They are Steve Olson and Kathleen Archer, Jose Guillen and Bill Rosseau, Casey D’Angelo and Matt Everson, and Julia Parranto and Kathy Schwartz. 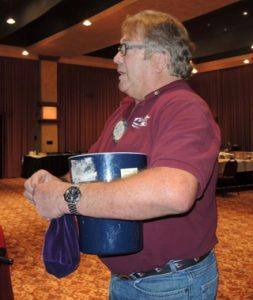 These Rotarians are the heart of the program. Their responsibilities range from attending the designated workshops, listening to the conference calls, and contacting their assigned students to make sure the assignments are completed. 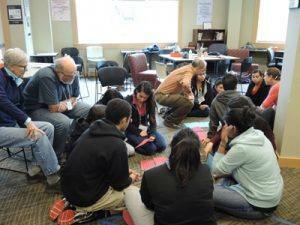 In addition, they are the main support for the students as they develop their Action Peace Project(s). Kristen Madsen – Creative Sonoma. Kristen discussed “creative industries”. This is a loose term applying to anyone making their living in a creative way, be it design, industrial or fine arts, dancing, music, fIlm, etc…. Kristen cited some statistics noting that creative industries account for 293 billion dollars in CA each year or or 1 in 9 jobs. The creative self-employed sector is growing faster than any other self- employed sector. Kristen then described a couple of local examples of Creative Industries. Zach Rhodes, a local Petaluma artist started a “Free Art Friday” scavenger hunt which has been copied by others. She also told us about Jessica Martin who created the 428 Collective, an organization of artists, all women. This group started a subscription service for art. $250 per quarter. Finally, Kristen made a plea for the case of art in education. Noting that there is a positive economic impact. Students coming from schools where the arts are emphasized have a 5x higher school graduation rate. In college, there is a 3x higher graduation rate. As everyone knows, earning power is much greater for high school, and especially college graduates.